A good sports bra lets you move freely, feeling comfortable and supported through any workout. Here’s how to choose the perfect fit for your body. Having breasts can be stressful sometimes. Like, when you have to run for the train. Or when you feel a little too loose and free in your yoga flow, or the group fitness instructor says it’s time for jump squats. For the most part, you can exercise perfectly well without splashing out on fancy active wear. But if you’re someone who needs support in the chest area, a decent sports bra is almost essential. Feeling supported and comfortable means you’ll have the confidence to move freely, so you can perform better and get more out of your workout. Breasts like to move about the place when we’re active – up and down, side to side. It’s a consequence of being so soft, round and lovely. Sometimes it’s just annoying and uncomfortable, making us feel like we have to restrict our movement. Sometimes it can cause pain. And over time, too much bouncing can cause damage to the soft tissue and delicate ligaments inside the breasts, which give them their shape. Bra expert Adele Kershaw, head designer at Berlei Innovation, says being supported during exercise is important no matter how large or small your breasts are. The idea isn’t to stop your breasts from moving completely, but to reduce it to a comfortable minimum. Like with your everyday bras, it’s always a good idea to get professionally fitted for a sports bra if you can. A bra fitting specialist will help you find the perfect size and style, making sure you feel comfortable and confident to move in it. Of course, it’s not always possible to get into a good store for expert advice. But there are a few things to know that will take a lot of the guesswork out of your shopping. Sports bras come in lots of different styles, designed for different body types, workouts and levels of impact. Some are underwired, some are more of a crop-top style. Some are padded with foam contour cups for more lift and shape. Whichever style you prefer, it’s important that it fits properly. A poorly-fitting bra can leave you feeling unsupported or too restricted – or worse, aching with neck, shoulder and back pain. And if you’ve ever experienced bra straps digging into your shoulders, wires poking into the soft undersides of your breasts, chafing under your arms, or an underband that feels more like a corset, you’ll know it’s just not worth it. “It is essential that you feel comfortable in a bra when being active,” Adele says. “While each woman has personal preferences when it comes to choosing a bra, sports bras should feel firm but not restrict breathing or movement. Look for a bra with a strong, wide underband to give you support. The band should fit snugly – firmer than an everyday bra, but not so tight that it’s uncomfortable. The back should sit level with the front, without riding up anywhere. Your breasts should fill the cups completely, but not be spilling out in any direction. This is important for effectively limiting movement. There are lots of different styles of straps – racerback, criss-cross, tank top style. In any case, they should fit firmly, but not too tight. You don’t want them to be slipping around, or digging into your skin. 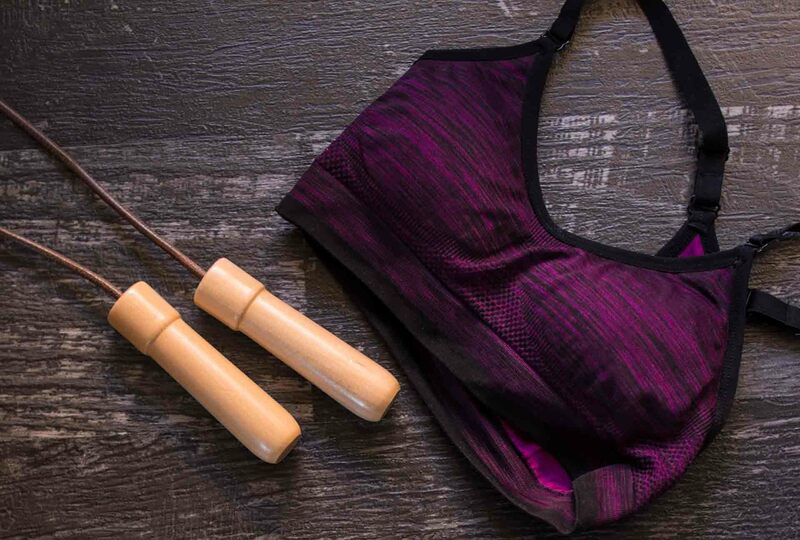 Most sports bras will have adjustable straps, so play with the length to find a good fit for you. Some will also be convertible, so you can try crossing them over if that feels better during movement. Keep in mind that straps will stretch over time, so it’s a good idea to leave room to tighten them further. If the bra fits perfectly on the tightest possible adjustment, try a different style.